Falling For Me : Always Go For Gold! If we learned anything from today’s Women’s Olympic Hockey game, it’s NEVER GIVE UP. Can I just say I AM SO PROUD OF OUR CANADIAN WOMEN’S HOCKEY TEAM! Hearts across our nation dropped, as the U.S. team took an early lead and held on to it for most of this game. 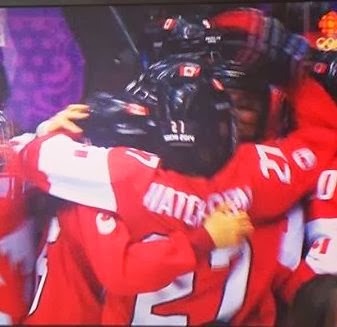 With less than four minutes to go in the third period, our ladies were able to tie the game, suddenly giving hope to Canadians across the globe. What seemed like a silver medal win instantly became the chance of a lifetime for this team. Could they win their 4th Olympic gold? It was well within their reach again. And win it they did! Eight minutes into OT, Marie-Philip Poulin scored the golden goal and cheers for this AMAZING CANADIAN WOMEN’S HOCKEY team were heard around the world. Many thought that a win was impossible as the minutes ticked away in the third period. But this team of amazing women pulled together and made it happen. And there is a story here. It ain’t over ‘til it’s over. Something was restored in the universe today, something that falls under the name of hope and belief. As long as these live in your heart, anything is possible. Team Canada proved it today. It was a terrific comeback that will be remembered for years…or at least four! TALK TO ME! Tell me about times when perserverance and hope catapulted you to success? Why Starve When You Can Indulge? Happy Valentine's Day....Now Get Out!